US Vice President Joe Biden reportedly offered division of Jerusalem, total 'settlement freeze' in exchange for very little; Abbas refused. Palestinian Authority leader Mahmoud Abbas reportedly rejected a new peace plan outlined by visiting US Vice President Joe Biden yesterday, according to Arab media reports. 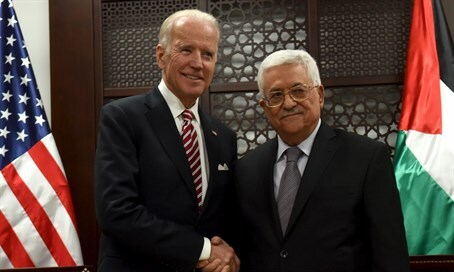 Abbas and Biden met in the PA leader's Muqata headquarters in Ramallah on Wednesday, following Biden's meeting with Israel Prime Minister Binyamin Netanyahu. According to the Palestinian Al-Quds newspaper, the US Vice President used the opportunity to present Abbas with a fresh initiative, which would have included dividing Jerusalem and a total freeze on Israeli "settlement building" in Judea, Samaria and Jerusalem. In return the PA would be expected to recognize Israel as the Jewish state, and give up its demand for a "right of return" for the descendants of Arabs who left the country during the Israeli War of Independence in 1948. Abbas, not for the first, promptly rejected the generous offer. The the meeting came after Biden leveled strong implicit criticism at the Palestinian Authority and its leadership for failing to condemn the ceaseless wave of deadly terrorist attacks against Israelis.